It's not Waters at his best yet it reinforces just what a towering figure he is in the history of the blues and popular music. Breakin' it Up, Breakin' it Down was approximately one foot and a few days away from being lost forever. Seriously... how does that stuff happen? Several soot-covered boxes of recording tape – many labeled with Muddy Waters' name – were nearly thrown away after being more or less abandoned by the now-defunct Blue Sky label. Fortunately, not only were these boxes saved but the music contained therein is finding its way into the hands of blues lovers the world over. The first gold mined from those boxes came in the form of the deluxe edition of Muddy “Mississippi” Waters Live. That album was originally released as a single LP. A second disc, consisting of material excavated from these boxes, was appended to the set when it was re-released in 2003. Breakin' it Up is the latest treasure to be issued from what was almost trashed. Breakin' it Up, Breakin' it Down marks the first time the 11 songs on this live album have been released. The songs are taken from three March 1977 shows from the Hard Again tour (those shows were the March 4 show at The Palladium in New York, the March 6 Tower Theatre show in Upper Darby, PA, and the March 18 show at The Masonic Temple Theatre in Detroit). 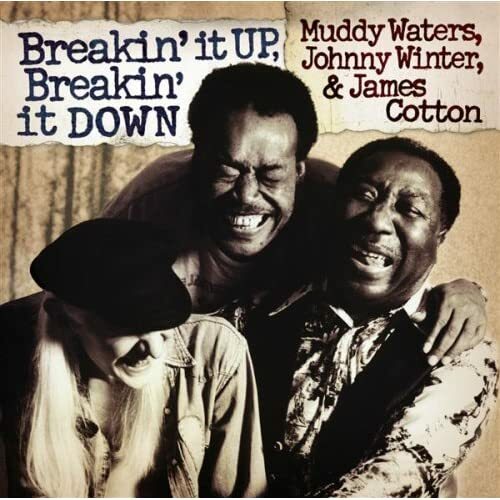 The album is credited to Waters, Winter, and harp legend James Cotton, which is entirely appropriate because Waters performs on the first three tracks and on the final two. Robert Gordon's writes in his fabulous Waters' biography Can't Be Satisfied Muddy was often seen working the room in the Chicago clubs he once ruled. He'd would jump on stage periodically before helping close out the set. No one felt cheated by this back in the Chicago days because the incredible Jimmy Rogers and Otis Spann would take lead while the big man schmoozed the guests. Whatever the reason, Waters was still in the habit of taking breaks and leaving things to his crack band. Hard Again was the Grammy-winning comeback album Waters recorded for Blue Sky after leaving legendary Chess Records. It was produced by Winter and the band assembled for that album – including himself — is the same that accompanied him on tour and is captured here. Winter and harp legend James Cotton step out front during Waters' breaks. Cotton's voice was beginning to show signs of wear after years on the road, occasionally sounding completely shot. Winters' enthusiasm and good cheer is evident throughout. In addition to Winter and Cotton, Waters was backed by Bob Margolin, Pinetop Perkins, Willie “Big Eyes” Smith, and Charles Calmese. It was generous for Waters to share the spotlight with his cohorts – and made for an easier night for himself – but that generosity sandbags the record. There is a major disparity in the intensity and energy between the songs with Waters and those without him. James Cotton is a legend and Winter had a successful career, but neither is in Waters' league and that can be heard on this disc. “Caledonia” is one of the highpoints on this set and best examples of what Waters' presence means to a song. His performance is vital and magnetic and his interplay with Cotton and Pinetop is priceless! The way these three veteran blues ambassadors are trading lines and jokes makes the years melt away. This is the magic that only happens on stage and in the moment. It's tragic to think about how close these performances came to being lost forever. Other standouts include “Can't Be Satisfied,” the song that helped put Waters on the map. He recorded it several times throughout his career and performed it often. Waters has the band take it down a notch and in so doing actually infuses the song with incredible soul and power. Waters also sounds fantastic on “Trouble No More,” a song he rarely performed that was made famous by the Allman Brothers Band on Live at the Fillmore East. Blues lovers will – and should – flock to this disc. It's not Waters at his best yet it reinforces just what a towering figure he is in the history of the blues and popular music.